I like applique quilts, but I actually MAKE pieced quilts. I like both regular and paperpieced quilts. I prefer bed size, but it's probably best to give a range of sizes. I'm into modern fabrics these days. And, it should be of intermediate difficulty. 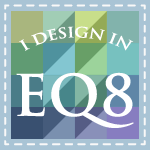 I've decided that I'm not in the quilting olympics - there is no reason to push myself higher, faster, stronger. I'm just doing it for fun. So, it should be challenging enough that I don't get bored, but not too challenging, or I won't finish it. I enjoy making quilts with a pieced background and some applique. I make projects of all sizes, and often re-size a pattern to make the size I want. I occasionally make a simple quilt, but honestly, I prefer a challenge or I get bored. It is always nice to have a quick and easy pattern in your pocket in case you need to make a gift in a hurry. Since I've been quilting for a few years, I like scrappy projects to use up some of my leftovers. I have no real preference as to type of fabrics - I use them all! I like when a quilt is made that has something for every degree of difficulty when it comes to quilting. Like the Calyso quilt, which can be made more ways add a boader then add an applique either at the top or all the way around. 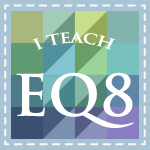 Now the difficulty of the same quilt has changed, Since I want to be challaged when quilting, and that for me is the in the techniques used. Calypso looks like such a fun quilt! Congratulations on getting it published. I like pieced quilts that LOOK complicated but in reality are easily pieced. I know that fits a huge bill but the illusion of difficulty will keep me interested and the easiness of piecing will be more likely to get finished. The modern quilt with open spaces for quilting are attracting me more and more. I like a simply pattern if I need one in a hurry but at times a more difficult one to keep me interested and to improve my sewing skills and learning. My suggestion is offer a variety of patterns and each will be appreciated by all. As many quilters we do not always use the same colors or fabric as suggestred in the directions.I think you do what is comfortable for you ,something not too boring for youself and at the same time a challenge and the quilters will follow. Keep up you good work. 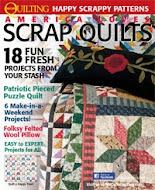 Iwould like to make it with Scrappy Fabrics from my stash! It is a simple and fast pattern I like to use. I like quilts that look harder to make than they are. I prefer scrappy quilts rather than one made from a single line of fabric and I like quilts that combine piecing and applique. I love the loook of applique, but all I do right now is pieced quilts. I've started to move towards a more modern look, using alot of solids. I don't want something that is just the same 12" block for the whole quilt. More a mix of block sizes - some complex, some simple for a clean look. I liked your Jewels in the Crown. The blocks were all different and could be paper pieced. I prefer bed size patterns or ones that may be easily enlarged. I do not want to do the same block 15, 18, or 24 times. Many of us are way beyond easy. Just my opinion. I would love a scrappy one. I have no modern fabrics due to strict budgeting so scrap is about my only choice. I agree that a quilt that looks more complicated than it is sounds good. 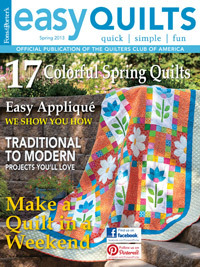 I think that a lot of magazines now show quilts in more than one colorway but I think that could be improved upon. Brights, scraps, civil war reproductions, not to mention 30's would all be able to totally change the look of a design. Not everyone is gifted with the ability to imagine this without assistance. I am totally into shirting fabrics right now, which would be a different class of scraps. love applique! on blox, on whole cloth, on piece work, applique is my bag, so i'd like to see more applique work, please! I would like a Bed-size Medallion quilt with both piecing and applique Rounds. That way folks quilting along can cease after any round they want if 'the size is right for them or life gets in the way' of continuing. I'd love to see it in a fun "Spanish-flavor " colorway. Congratulations, your Calypso Carneval is sooo beautiful and bright! Slowly catching up on the Vintage Sampler beauties...happy designing and hugs from Germany! Something modern that is pieced and maybe some applique in the corners and borders. Also love blocks where you make 2 different ones that come together; it looks difficult to make but the 2 blocks together simplify it. 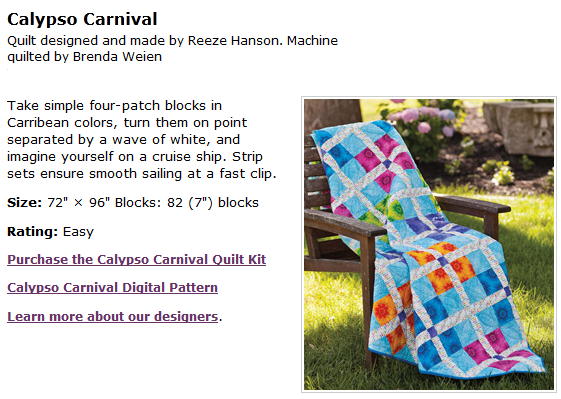 Love the happy calypso quilt! miniature applique, please! Love your work. I would have to say that applique quilts are my number one favorite and the ones I enjoy doing the most. The dimensionality that applique gives to a quilt really makes it pop! I will, however, sometimes use a pieced block as a background for the appique. I like scrappy + "tradition with a twist" -- new ways to use traditional blocks. 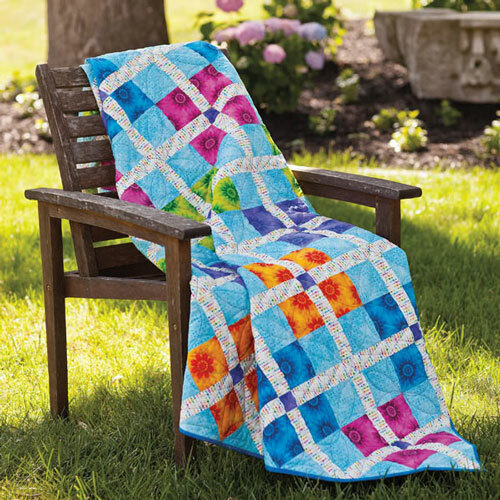 Last week I bought "Quilt Challenge" by Sharyn Craig and Pamela Mostek (87% *off* at Tuesday Morning; how could I resiste?) -- the interpretations of block or theme or color are very inspiring. I admire applique but I don't do much of it.